Art By Committee: "Looming Up"
Most people know why the sky is blue: small particles in the atmosphere scatter the shorter (blue and violet) wavelengths from the white sunlight so that the blue light bounces around in all directions, covering the black void of space with a veil of sapphire. As artists, we need to know a little more than that. How does the sky color change as we look in different directions? Where is the blue darkest or most chromatically saturated? Here are two photos that were both taken at 4:10 in the afternoon of April 12 in Germantown, New York. The one on the left was taken facing the sun, and the one on the right was taken seconds later facing away from the sun. The clouds are completely different. Near the sun, clouds have dark centers and light edges. With the sun shining directly on them at right, they are lightest at the tops or centers and they get darker at the sides and bases. Smaller clouds are not as white because they have a lesser mass of vapor to reflect back the light. The color of the sky is different, too. Around the sun is a region of warm glare which weakens the chroma of the blue, making it more of a dull grey-green. Looking away from the sun, the blue is more saturated, tending a bit more toward violet. How do we know the camera isn’t deceiving us? Is there another way to check these observations? I went to my local hardware store and picked up a bunch of blue paint swatches. Here’s how the sky looks compared to the paint swatches while facing away from the sun. 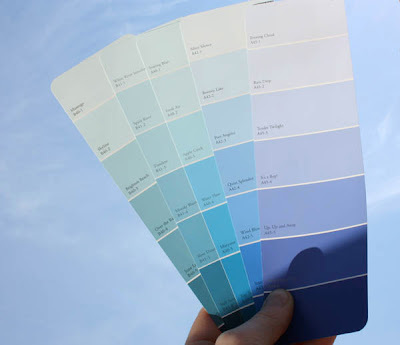 One of the blue swatches (A) is a close match to the adjacent area of the sky. I wanted to photograph the swatches while facing toward the sun, but I had a problem. There was no way to angle them so that the sun could shine directly on them. So I set up a mirror on the windshield of my car to bounce the light back onto the swatches. But we can’t trust this comparison, because those color swatches are lit by the warm light bouncing up from the ground and from my t-shirt. That’s why the swatches look a little warmer than they should. 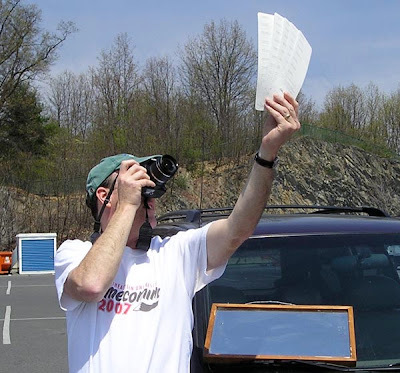 Here’s another experiment to demonstrate how the sky gets lighter near the sun. I took a single paint swatch, cut it in half, and taped the symmetrical halves on a mirror to make a device that we can call a "cyanometer." None of the swatches matches the sky exactly. The hue and chroma are different, but the values come close in a couple places. Clearly the value of the sky darkens as we shift our gaze horizontally away from the sun. The left arrow, nearer the sun, matches the value of the lightest swatch, while the right arrow, just a little bit farther from the sun, matches a swatch that’s two steps darker. 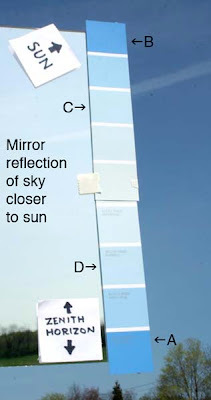 The mirror is reflecting another section of the sky, which also gets darker from left to right. The sky color shifts in value from zenith to horizon, too, as we can see when the cyanometer is arrayed vertically. At (A) there’s a close match of value between the darkest swatch and the distant sky, even though the chroma is different. Higher in the sky at (B), the same swatch looks much lighter than the sky surrounding it. The mirror reflection shows an instant comparison of what’s going on behind us in a region nearer the sun. This area of the sky is much brighter in value, as well as being duller in chroma, confirming the first pair of photos in this post. The swatches at (C) and (D) show us that the sky in the region of the sun stays about the same value as it goes up from the horizon, because the increasing solar glare offsets the effect of lightening near the horizon. Let’s draw some general conclusions from these observations. First, there are two separate but overlapping systems of color gradations in a daytime sky. One system, "solar glare," is governed by the proximity to the sun. The other, "horizon glow," depends on the angle above the horizon. In each of these two systems the sky color gradates in value, hue, and chroma. These two systems interact with each other so that that every patch of sky gradates in two different directions at once. 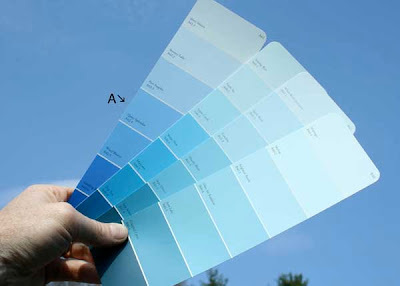 This means that the painter in opaque colors needs to mix at least four separate starting colors to paint any given segment of clear blue sky. As we move from the zenith to the horizon, the sky generally tends to get lighter, because we’re looking through more atmosphere. A poet might say we’re peering through more veils drawn across the void of heaven. Near the horizon, depending on the time of day and the direction of view, the sky color can range from a pale cerulean to a warm grey to a dull orange, but usually it’s a whitening. As we approach the sun, the color gets lighter and warmer because a great volume of white light is scattered at shallow angles by large particles in the atmosphere. You can see this best by standing near the edge of the shadow of a building with the sun just hidden behind the roofline. A weaker but noticeable lightening also occurs at the “antisolar point,” 180 degrees opposite the sun. The point of the darkest, deepest blue, which I call the “well of the sky,” is at the zenith only at sunset and sunrise. To be precise, the well of the sky is actually 95 degrees away from the setting sun across the top of the sky. At other times in the day, the well of the sky is about 65 degrees away from the sun. Why is the sky blue? Link. Minnaert and scientists as early as Humboldt built instruments that they called cyanometers for observing sky colors, but they were of a different design, link. Photos were taken without polarizing filters. First, I must say I love your blog- I've learned so much from it! This post reminds me of a segment from Leonardo da Vinci's notes- in a book called 'Leonardo on painting'. He discusses the colors in the sky as well as the effect of the atmosphere on the surrounding countryside. If you haven't read it already, I bet you would love it- it seems like the sort of thing you'd be into! Our local art society has an annual art show at the Veteran's Hall as part of our town's Apple Blossom Festival. For years I've attended and enjoyed it, and even bought several landscapes. Your blog transformed my experience of the art show. I cannot help but notice errors of perception recorded by artists who seem not to have paid much attention to their subject. The rare paintings that evidence a disciplined eye stand out much more plainly. Your blog has educated my eyes, as it were, and made me much more aware of what my eyes actually see. Thanks for the in-depth field study. Your continued efforts of combining science and art is greatly appreciated. Thanks for putting this up. It's something I've noticed before, but I think this is the first time I've ever read anyone try to explain it. The last message was spam with virus danger, so that's why I removed it. Thanks so much for your continued efforts in sharing your knowledge and observations! I appreciate every single post you make, and this one in particular will change the way I see the sky for sure! I've never commented here before, but I just wanted to say that your blog is an unbelievable resource and you are fantastic for putting up such detailed entries every day, and impressive for not running out of ideas. Thanks so much for commenting, Carly, and everybody else, too. Say hi to Matt and the rest of the gang at RIT. Do you have more on painting clouds? Like the part about smaller clouds being darker? Thank you for the great blog! It's a great inspiration! Thank you so much for posting this. This will seriously help my matte painting career. As I look at matte paintings by the master I can always get a sense of direction(North, South, East, West). And now I can understand why. In a late afternoon painting clouds with a darker underbelly will be in the east. This is very cool--what a great explanation. I loved your use of paint swatches, too. In my husband's color and design classes, he spends a lot of time having people paint value scales, color wheels, etc. and then has them use particular combinations of color in various projects. I'll have to make sure he sees this post! It would be a great way to supplement his lectures on value and hue. Thank you so much for this post and all your earlier ones. I find your blog an absolute treasure trove of useful information. It was nice to see the paint swatches, I posted on my blog a while ago about using them to help with colour choices. Wow clear and understandable for this resource and your generosity I am grateful, thank you!